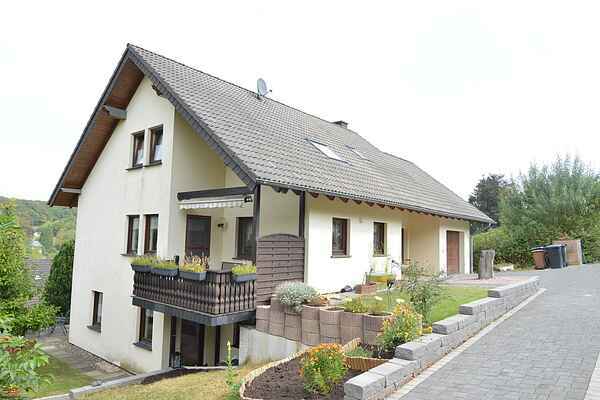 The apartment is quietly situated at the outskirts of Üxheim-Niederehe. The cosily furnished, separately accessible apartment is equipped with underfloor heating, kitchen, bath, living room and bedroom. Outside you'll find a terrace with garden furniture and a sunbathing lawn. A parking space is at your disposal. In short, a comfortably furnished apartment that invites you to relax and offers many opportunities for excursions and endless hiking and cycling trips. Niederehe is located in the Vulkaneifel at 420 m above sea level. The town is nestled in a small valley basin surrounded by meadows, fields, forests and juniper slopes, among them the "Hönselberg", a nature reserve with several types of orchids. The view of Niederehe is characterised by the former monastery and abbey whose oldest parts are from the 12th century. In the immediate vicinity you have the charming Kalkeifel bike path, beautiful hiking trails including the "Eifelsteig"premium hiking trail as well as the Eifel crime thriller-hiking trail for fans of the genre. Other hiking destinations in the area are the "Dreimühlen" waterfall, Kerpen Castle and the "Grönerhof" cheese factory. There are numerous day trip destinations in the area: i.e. The eagle and wolf park Kasselburg near Gerolstein, the wildlife and adventure park and the Eifel maars (volcanic crater lakes) in Daun, the crime thriller capital Hillesheim. The world-famous "Nürburgring" racing circuit awaits with numerous events and attractions. The cities of Trier, Cologne and Coblenz as well as the Phantasialand in Brühl are within an hour's drive away.